Make a lasting impression in your new 2018 Toyota Camry, a sedan styled with unique detailing and state-of-the-art features that make it difficult to ignore. Indulge in the vehicle's admirable elegance, inside and out, then appreciate its generous collection of performance capabilities, safety features and innovative technologies. Still need convincing? Swing by our Toyota dealership in Saginaw, MI, for a test-drive today! 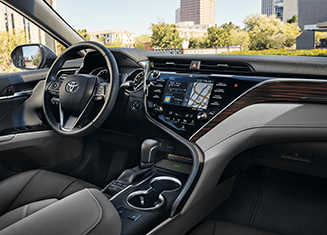 Is the smart, stylish sophistication of the 2018 Toyota Camry beckoning you by name? Answer the call by taking a test-drive today at Serra Toyota Saginaw! Radio and Technology: 7-in. touch-screen, AM/FM, MP3/WMA playback capability, six speakers, Connected Navigation Scout® GPS Link App, Siri® Eyes Free, auxiliary audio jack, USB 2.0 port with iPod® connectivity and control, hands-free phone capability, voice recognition and music streaming via Bluetooth® wireless technology. Radio and Technology: One USB port, One 12V auxiliary power outlet, 7-in. touch-screen, AM/FM, MP3/WMA playback capability, six speakers, Connected Navigation Scout® GPS Link App, Siri® Eyes Free, auxiliary audio jack, USB 2.0 port with iPod® connectivity and control, hands-free phone capability, voice recognition and music streaming via Bluetooth® wireless technology. Radio and Technology: Three USB ports, One 12V auxiliary power outlet, 4.2-in. TFT Multi-Information Display with odometer, outside temperature, fuel economy and trip information, current/average fuel economy, distance to empty, average speed, trip distance with timer, hybrid system information, energy monitor and warning messages, Integrated backup camera with projected path, Entune™ 3.0 Audio with Connected Navigation Scout® GPS Link App and App Suite - includes 7-in. touch-screen, AM/FM, MP3/WMA playback capability, six speakers, Connected Navigation Scout® GPS Link App with 3-year complimentary trial, Entune™ 3.0 App Suite, Siri® Eyes Free, auxiliary audio jack, USB 2.0 port with iPod® connectivity and control, hands-free phone capability, voice recognition37 and music streaming via Bluetooth® wireless technology. Access to Entune™ 3.0 App Suite is subscription-free. See toyota.com/entune for details. Radio and Technology:4.2-in. TFT Multi-Information Display with odometer, outside temperature, fuel economy and trip information, current/average fuel economy, distance to empty, average speed, trip distance with timer, hybrid system information, energy monitor, TPMS and warning messages, Integrated backup camera64 with projected path, Entune™ 3.0 Audio with Connected Navigation Scout® GPS Link App and App Suite - includes 7-in. touch-screen, AM/FM, MP3/WMA playback capability, six speakers, Connected Navigation Scout® GPS Link App with 3-year complimentary trial, Entune™ 3.0 App Suite, Siri® Eyes Free, auxiliary audio jack, USB 2.0 port with iPod® connectivity and control, hands-free phone capability, voice recognition37 and music streaming via Bluetooth® wireless technology. Access to Entune™ 3.0 App Suite is subscription-free. See toyota.com/entune for details. Radio and Technology:7-in. TFT Multi-Information Display with customizable settings, odometer, outside temperature, fuel economy and trip information, current/average fuel economy, distance to empty, average speed, hybrid system information, energy monitor, TPMS,55 scheduled maintenance, compass and warning messages, Entune™ 3.0 Audio with Connected Navigation Scout® GPS Link App and App Suite - includes 7-in. touch-screen, AM/FM, MP3/WMA playback capability, six speakers, Connected Navigation Scout® GPS Link App with 3-year complimentary trial, Entune™ 3.0 App Suite, Siri® Eyes Free, auxiliary audio jack, USB 2.0 port with iPod® connectivity and control, hands-free phone capability, voice recognition37 and music streaming via Bluetooth® wireless technology. Access to Entune™ 3.0 App Suite is subscription-free. See toyota.com/entune for details. *Based on 2017 EPA mileage/highway estimates and driving range ratings. Use for comparison purposes only. Your MPGe/MPG and driving range will vary depending on driving conditions, how you drive and maintain your vehicle, battery age/condition, and other factors. For additional information about EPA ratings, visit //www.fueleconomy.gov/feg/label/learn-more-PHEV-label.shtml.